How would a system that sustains hope look like? What kind of indicators should we have, and how should they be interpreted to allow a society to flourish on hope? The previous blog explored how a society based on fear could have their indicators interpreted in ways and sustained. What I want to do now is to think about the reverse – how would indicators look like, and would be interpreted if we were serious talking about a Singapore based on hope. Hope could be expressed in terms of giving people multiple chances of a decent life. That means accepting that people will fail, and to provide the opportunities to try again. That also means a restructuring of the economy – that the opportunities do not just refer to social mobility on a vertical scale, but also on horizontal scales. That means the expansion of the number sectors in society. 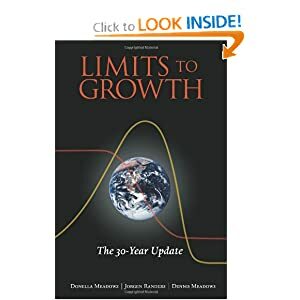 That social mobility improves with the horizontal expansion of the economy comes from experience – that the industrialization of societies led to the creation of many niches for people to fill, giving people the opportunity to move into additional climbers for people to climb on. Unless economic sectors expand substantially, people will be stuck with existing hierarchies, and hierarchies tend to leave little space at the top. The expansion of economic opportunities also means either the expansion of education domains, or removing the links between education and economy. Remove the signalling function of education and remove the disciplinary boundaries between education and industries; either action could lead to debates as to whether industries or the state is responsible for the matching between people’s skills and industry requirements. Mismatches happen when people are too committed into a discipline that might not offer “employable” attributes. At the same time, a porous skills market would allow people to pick up the skills for whatever industry that could be in vogue at any different time. Any of these things would mean very different approaches towards education and to how the economic structure. Giving people the flexibility to choose between skills would motivate employers to create non-financial incentives for prospective employees to stay. There would be serious thought about how to provide Singaporeans with a temporary minimum guarantee that will allow them to learn from life’s stumbles and give them the strength to carry on. We would be encouraging them to try out new things, whether or not they would make money in the immediate short term. To have hope as a new rhetoric would mean thinking about the longer-term and not just about present needs. A society based on hope would also have people who are self-assured of their current possessions, and be secure with their lives. That means that there should be a less intense rat-race, because people have little anxiety about how their lives are and how their children should compare with other kids. A society based on hope would give kids to enjoy their childhood and to expand the notions of learning far beyond the narrow focus on grades and performance and getting them to enjoy the essence of learning. They would also be imbued with a sense of character that would help them navigate around an ethically ambiguous world. In another way, a society based on hope would focus less on the hierarchies they are placed in, and more concerned with the connections between. With this self-assuredness, the desire for more property or more material possessions falls away. Yet there remains enough to fuel the hopes of the next generation and the generations to come. Losing the desire for more material possessions does not mean becoming less productive or less driven; the work ethic is independent of material possessions, but should come from the drive to succeed and to take pride in one’s work. Excellence in the work can be its own reward, no? And this cannot come primarily from fear. From hope we would ambivalent about pursuing investments from abroad, because the flourishing of entrepreneurship energy would also mean that Singaporeans are holding their own overseas. There would be less concern about competition because that would be just one facet in the range of relationships we would have with neighbours. Realism persists nonetheless; a single country cannot run on hope in its international affairs in a continually hostile environment. If any of these things are difficult to do, it would be difficult not because they are really that difficult to implement, but because of the changes in values implicit behind the behavioural and indicator changes. The aim behind all of these changes remains the same – they are still about providing Singaporeans with hope for them to lead successful lives – however they define success, but certainly with less emphasis on material grounds. How can we then, take all that’s been written in previous posts, and begin to imagine a different world? What are the assumptions that we need to change, what are the indicators that would help us keep track of change, and what kinds of decisions will sustain the changed world? There has been some thought about why all is not well in the world. In other places, I have thought about the role that indicators play in helping organisations make decisions, and the incentives structure that form the basis of the decisions. Indicators help us decide, but incentives motivates the decisions. The current model in societies assumes the insecure human being that needs material goods to attain temporary self-satisfaction. That self-satisfaction is threatened by the constant stream of new products, and the need to be compared with others. Advertising creates the insecurity and the demand, and the rest of the world’s manufacturing and services economy proceed to meet that demand. The biggest leverage in this system can be said to be the change in the internal expectations of oneself. Changing the assumption of what a person does and how he/she thinks is fundamental to the relationships he/she brings to other people in a community and to the everyday things around them. Changing that self-image changes also the relationship to activities, and to the institutions encountered. Changing the self-image changes everything. What should that self-image be? First off, thinking about the self-image is only possible when the vital needs have been met. Physical security, food, water, air and shelter are necessities that cannot be taken for granted. The self-image does not stand alone either. A self-image would consider the emotional, social and psychological context that the person is brought up with. A nurturing family and a wider community are important in developing the child’s values and bring the child in relation to the history, values and institutions of the community. The self-image undergoes education and socialisation processes – the practices and relationships that will allow the individual to contribute meaningfully to the community. The individual thinks of developing him/herself to the extent that they can give off the best of themselves to the community. Different societies negotiate the tensions of the individual, family and wider community with different tradeoffs. Some societies celebrate individual difference, whereas others hold on strongly to communal ties or national ties. The point is that different societies will provide different templates of self-images to individuals. In the modern societies that many of us are part of, the self-image also includes the individual as a perpetually insecure person that requires material goods to be complete. The self-image is tied to strongly with new and sophisticated material goods and how others view those possessions. This self-image is self-regarding and leaves room only for other-regarding insofar as much as they contribute to self-regarding. I believe that a different set of self-images would lead to a different kind of world. A self-image that is other-regarding for its own sake relies less on material goods and more on the self-ability to contribute to others. This “others” need not refer to persons only, but can also refer to abstract goods – causes, research, aesthetic attainments, sporting achievement, amongst others. This other-regarding can lead to a “striving self”. This striving-self is compatible with ideas that autonomy, mastery and purpose are important motivators in endeavours. In the current self-regarding paradigm, the indicators are the amount of material that the self has acquired, and continues to attain. The measure of that is with the amount of capital that one owns. Since capital is nearly the universal measure of material, capital also becomes the target of acquisition. Since material is one major component of the current self-image, so capital becomes the same. There is no limit to the amount of capital that can truly fulfil the self-image securely; the nature of the game is that the self becomes always insecure from the constant stream of new possible images of the self. The self can always be better looking or better fulfilled from the acquisition of new material and capital. The current set of incentives skews towards the self-regarding, and not enough of the other-regarding. There are no clear indicators that can move clearly in the direction of the other-regarding as is at present with the self-regarding. Far from there being a universal indicator at present (material and capital), the other-regarding has only individual indicators (what do I want to do for others?). While these are set by cultural norms in society, the individual expressions of it can be unique and should be so, given the idiosyncratic range of talents distributed in society (do what you can for others, with what you have). In a transitionary view, the self-regarding and other-regarding selves are not in contradiction. The self-regarding learns about self-abilities that contribute to the other-regarding. Framed in this sense, the indicators would be not, “how much capital and material do you have?” but, “what have you done with the capital and material that you have?” If the latter was used, then some quantitative measures could be devised to track the capital utilisation of individuals and organisations. Whether or not we want to pursue fully is another question. What will drive other-regarding? The issue here is that the values of other-regarding are very different from the current paradigm of self-regarding. Even though there are indicators that would make sense of this other-regarding, there’s still some way to go in thinking about the nature of these indicators and how they will be evaluated or measured. The current set of indicators I’m thinking about are direct and superficial – they track the outwardly-seen outcomes. 1. How many lives have I touched? 2. How many meaningful conversations have I had? 3. How many communities have I meaningfully participated in? I find that these questions are only useful starting points, and cannot yet get at the heart of things. The word “meaningful” is especially important in trying to get at the intentions of the actions. In principle, the depth of conversations could be measured by measuring emotional responses or capturing the semantic depth of the concepts explored, but those things cannot be conveniently explored as with current systems, their paradigms, and their indicators. The definitions of “meaningful participation” suffer from the same problem of inexactitude. Limits of imagination prevent me from thinking about possible indicators that would drive the system and incentivise participants towards maintaining such a system. Comments are more than welcomed! A single idea by itself doesn’t stand for much, but one often finds a series of ideas, that when brought together, have powerful implications. The 4 books above, when brought together, represent a compelling story about the trajectory of the world that we are on. 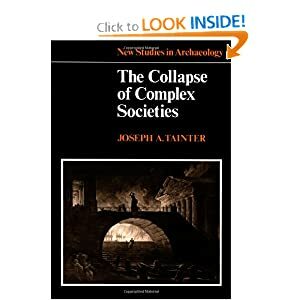 Tainter’s Collapse of Complex Societies tells of the fundamental reasons why civilisations rise and fall. The main reason is simply that social organisations can become too complex that they collapse under their own weight when they can’t find new resources to solve new problems. Hence the western Roman Empire could not always tax the population while fighting the barbarians and improve food output in the context of changing climatic conditions. In this post, Collapse serves as the main meta-narrative – how the story of the world’s collapse might be told. 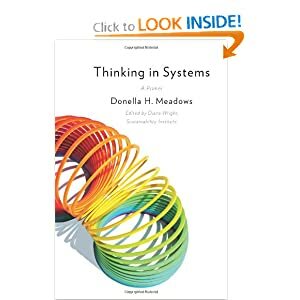 Systems Thinking, as represented by Donella Meadow’s Systems Thinking: A Primer, and the Limits to Growth: A 30-Year Update (LTG) represent another crucial element in understanding the processes through which a plausible environmental and socio-political collapse of the world might occur. While the words might sound abstract, these processes have real consequence. LTG belongs to the category of ideas that ought to be proven wrong. To cut the story short; LTG notes that the world is already in overshoot in the drawing of resources from the planet – renewable resources are being extracted without thought of their capabilities to regenerate; non-renewable resources are being extracted without thought of how they might be substituted with renewable sources; and the actual improvement of human welfare is being undermined by the increase in pollution and eventually by their actual health consequences. LTG’s example of CFC’s ban and the preservation of the ozone hole represents a positive example of how action is possible to avert a global catastrophe. Not all is lost, but the window for change before collapse is imminent is narrowing very quickly. With every year of inaction, we hurtle towards our own collapse in our interconnected world. 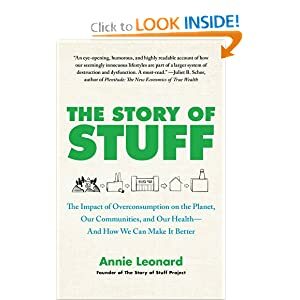 Annie Leonard’s The Story of Stuff is an illustrative example of systems and processes. Without explicitly using the language of systems thinking, Leonard nonetheless illustrates the flows and stocks of natural and human resources that come together to create the products that we take for granted. Plastics and the trace compounds used in their production present as-yet unknown health hazards, and preliminary findings of their role as hormone disruptors and as carcinogens are extremely worrying. The costs to human welfare in developing countries are tragic in all the sense of the word – from irresponsible toxic dumping to the horrid conditions of work – these represent a moral case against the excesses of the lifestyle of those in the developed countries. The entire system that creates the stuff in the first place is also clearly presented: the kind of economic system that believes in the unadulterated power of markets to bring about human welfare and the creation of demand via advertising and the grafting of status upon material goods at the expense of other expressions of human dignity. What is the synthesis then? The only way to avoid collapse, as far as the books seem to indicate, is to embark on a lifestyle that reduces the emphasis on the material goods.To want less stuff, and to find contentment in the many other ways beauty and wonder are expressed. If the end goal is human happiness and dignity, these qualities can be attained through other creative means other than to demand more stuff in our lives. The slackening of this demand ultimately reduces the extraction of resources from the planet and the accompanying pollution; in the pursuit of being less centred on stuff, we can become more connected to the social milieu around us, and find the happiness that we so crave. I would first say that I need to read more about local writing, since my current sampling has simply been Catherine Lim. Based on that, and from other isolated examples, I’m getting the feeling that the better stories are the ones that revolve around the change in values through the generations. I know, because I feel that change. And people caught in the transition – thats where the pain, the displacement, the disruptions are – where all the drama is, and that is perhaps why it makes for such good writing. I’m thinking of the Rafflesian girl who won the commonwealth essay competition based on the writing of a materialistic woman, and the seemingly antediluvian mother. But the main point was about how things changed, and the emotions from both sides… Like I said, I feel those stories because I’m caught in a similar situation too. I can hardly understand the heritage of my parents, and I do feel that sense of loss and alienation, and it pains me to see my parents unable to comprehend the present Singapore, and even more so when I realise that it is the generation of my (our?) parents who have built it, for us to enjoy, take advantage of. And thats where a part of my anger comes from, from my feel that these people, born from the 1940s-60s, they are just seemingly cast away… Thats where the stories of children leaving their families in old folks home… thats where all our staple of stories come from. Of generations losing their piety in a society that has gone such a radical shift in values that there is a disruption. Of course, these are just pretty words, and the critical reader will realise that there has been little substantiation behind these words. But heck. I am really tired of the phrases such as ‘changemaker’ and ‘social change’. After a point, these phrases become so overused that they become empty of meaning. I’m not sure myself about how I feel towards activism. I thought maybe I could clarify it a little here. I know there’s a part of me that’s still interested in social justice. I don’t think its a nebulous concept, but it is very clear. What I think it is, is to look towards a society with lesser, inequalities. I would think that inequalities would always be with us, but it is the extent which is the obviously the problem. But more than that, social justice, and by extension, social change, is about the effort required to enable more people to lead more meaningful lives according to their own definition. To me, it means to give empowering education, the kind of support of creative talent that Ken Robinson talks about. My starting point is that people were created to be good, and that given the right environment, they will make the right choices for their own lives. To me the debate about values is important, but not the whole point. Sure, you can trumpet the words ‘democracy’, ‘liberty’, ‘freedom of xyxyxy’, but all of that, is really peripheral compared to the reality of experience. By that I want to mean, ‘how are these values at work, and empower ordinary people in their everyday lives?’ Not that these values are peripheral, but what they mean, and how they work out in the lives of ordinary people – I think that is substantially more important. To me, that’s real social change, on the ground, at work in the lives of people. To me, social change, must be, and has to be, about people living out and fulfilling their value systems. Everything else is simply talk. Unless lives get better, unless I see a more loving, giving, and thinking society, everything is really cheap talk. But more to the point, values in themselves provide the social environment for a decent society. I’m really thinking that a values-based society is secondary to that of a love-based society. I want to add: that the society that I wish to see, is a love-based society, of sensitivity and tolerance, no matter the religion.